Ready right out of the box. Just charge, plug in and use with your iOS or Android device. 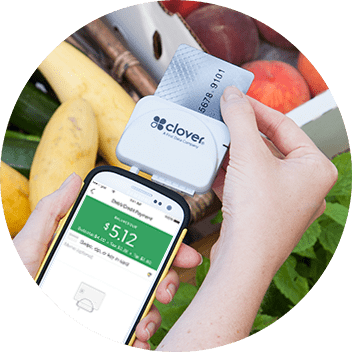 EMV® chip cards help reduce fraudulent activity, and your transactions are backed with Clover® Security data protection. All you need, at your fingertips with custom tip and tax rates, permissions for employees, transaction history and the ability to email or text receipts. Clover dashboard features and useful Insighticsdata that helps you see how your business compares to businesses like yours, and manage your business. Goes where your business takes you, flexibly accepting both EMV chip and ‘swipe’ card payments. 24x7 care and support are there when you need them.